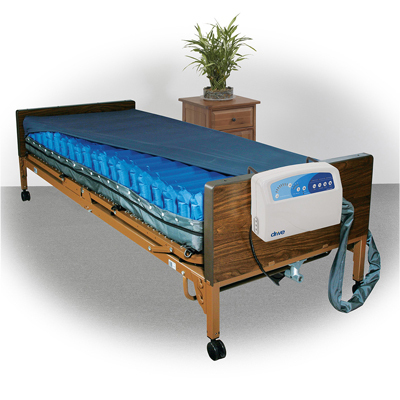 Alternating pressure mattress and pump systems. Altadyne™ 750000 pressure control knob allows firmness of mattress to be adjusted. LED indicator lights for low pressure alert. Lighted ON/OFF indicator switch. CPR valve allows for rapid deflation. Dimensions: 78.7" x 8" x 35.4"
Altadyne™ Plus touch pad adjustment with LED indicators. 10, 15, 20, and 25 minute cycle times. Lockable control panel. Low pressure and power failure LED indicators and audible alarms. CPR valve allows for rapid deflation. Altadyne ™ Sensor Plus uses alternating pressure relief support surface Auto-Adjusting technology. Includes 10 minute cycle time, lockable control panel, low pressure and power failure LED indicators and audible alarms, and CPR valve for rapid deflation. Altadyne™ XD suitable for use in the prevention and treatment of stages 1 - 4 pressure ulcers. Cycle time adjusts from 5 - 20 minutes, in 5 minute increments. 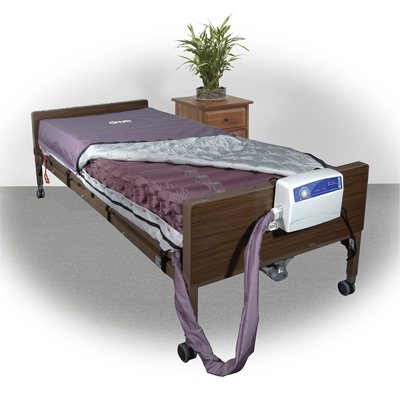 Provides 6 options for mattress pressure, plus an optional static mode. 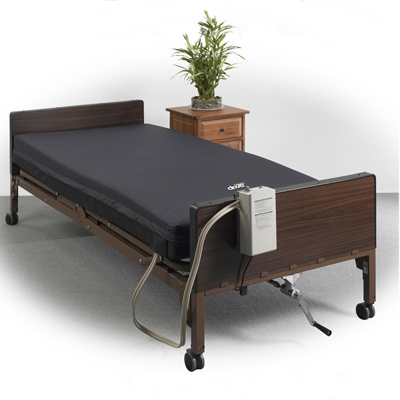 Dimensions: 80" x 8" x 42"
Dimensions: 80" x 8" x 36"
Balanced Aire Powered and Non-Powered 3 pressure zones independently self-adjusts to patient's need. System is sloped downward in the foot section to reduce pressure in heel zone. 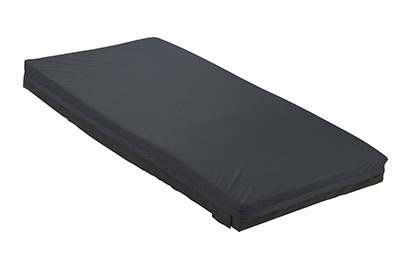 Dimensions: 80" x 7" x 35"
Dimensions: 80" x 7" x 42"
AQ1000 and AQ2000 bubble style pad effectively reduces pressure. 5-minute cycle. Pump mounts to bed with built-in mounting bracket and features an illuminated on/off switch. 275 lb maximum weight capacity. 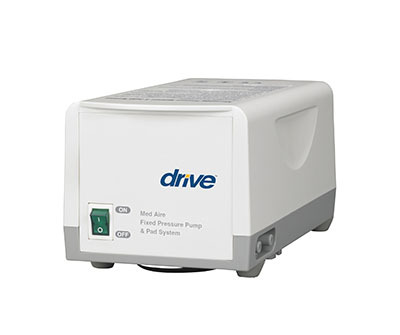 Dimensions: 78" x 2.5" x 34"
Med-Aire variable pressure alternating pressure pump with standard (78"L x 36"W x 2.5"H) pad features 130 individual bubble cells for maximum comfort and effectiveness. Variable pressure pump has 5-minute cycle time. Variable pressure setting on deluxe pump allows comfort setting for maximum comfort and compliance. Durable, heavy-gauge, premium vinyl bubble pad provides superior therapeutic treatment. Built-in bracket allows for easy mounting to bed. 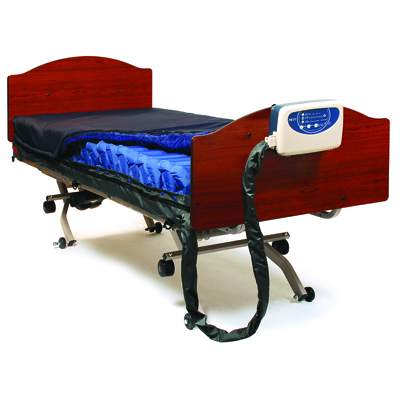 Dimensions: 78" x 2.5" x 36"
Med-Aire variable pressure alternating pressure pump with pad with end flaps (123"L x 36"W x 2.5"H) features 130 individual bubble cells for maximum comfort and effectiveness. Variable pressure pump has 5-minute cycle time. 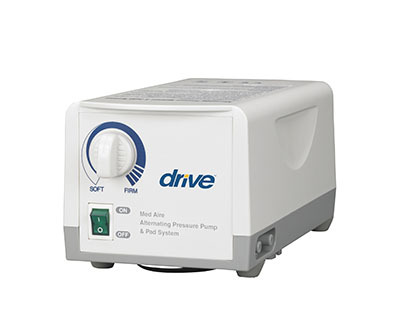 Variable pressure setting on deluxe pump allows comfort setting for maximum comfort and compliance. 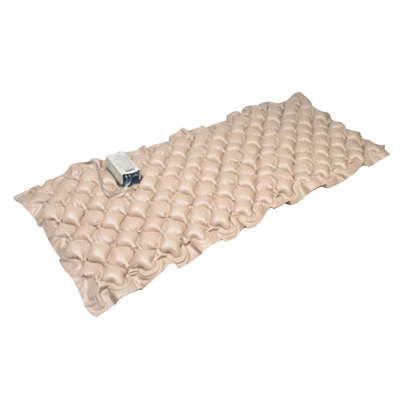 Durable, heavy-gauge, premium vinyl bubble pad provides superior therapeutic treatment. Built-in bracket allows for easy mounting to bed. 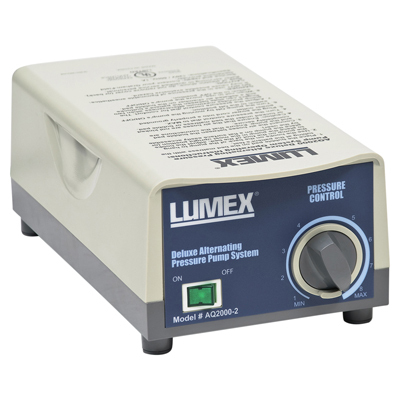 Dimensions: 123" x 2.5" x 36"
Med-Aire variable pressure alternating pressure pump features variable pressure pump with 5-minute cycle time. Variable pressure setting on deluxe pump allows comfort setting for maximum comfort and compliance. Durable, heavy-gauge, premium vinyl bubble pad provides superior therapeutic treatment. Built-in bracket allows for easy mounting to bed. Standard pad is for Med-Aire variable pressure alternating pressure pump system. Pad measures 78" long x 36" wide x 2.5" deep. 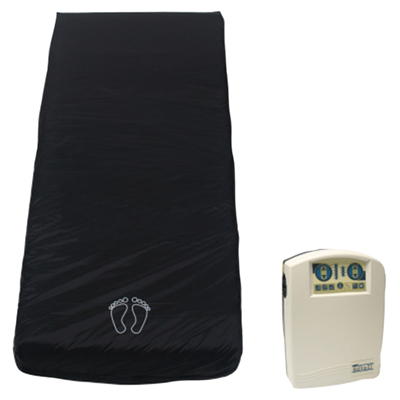 Pad features 130 individual bubble cells for maximum comfort and effectiveness. Pad with end flaps is for Med-Aire variable pressure alternating pressure pump system. Pad measures 123" long x 36" wide x 2.5" deep. Pad features 130 individual bubble cells for maximum comfort and effectiveness. 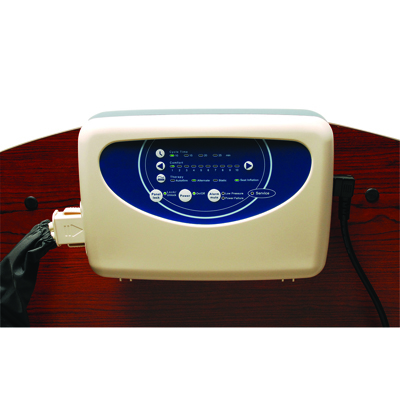 Med-Aire fixed pressure alternating pressure pump with standard (78"L x 36"W x 2.5"H) pad features 130 individual bubble cells for maximum comfort and effectiveness. Durable, heavy-gauge, premium vinyl bubble pad provides superior therapeutic treatment. Built-in bracket allows for easy mounting to bed. 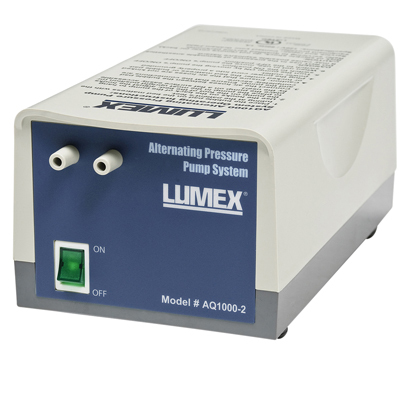 Med-Aire fixed pressure alternating pressure pump only. Standard pad is for Med-Aire fixed pressure alternating pressure pump system. Pad measures 78" long x 36" wide x 2.5" deep. Pad features 130 individual bubble cells for maximum comfort and effectiveness.